Per usual, this was shown on a two hour TV Broadcast so some matches will be clipped. We start off the show with a bang, with two seasoned well known veterans against two younger wrestlers with potential. Hamada is one of the leading wrestlers of Pro Wrestling WAVE, while Takako Inoue is a legendary wrestler from the heyday of AJW. Kadokura and Iroha both wrestle in Marvelous, with Kadokura just making her debut this year. Iroha is far more polished than Kadokura, which is understandable, so hopefully she does most of the heavy lifting in this match. We join the match slightly in progress with Inoue in the ring with Kadokura, Kadokura goes for a crossbody but Inoue catches her and tosses the rookie to the ground. Elbows by Kadokura and they trade kicks, Inoue gets the better of it and she tags in Hamada. Hamada gives Kadokura a hard elbow and a pair of scoop slams, cover by Hamada but it gets two. Hamada works on Kadokura’s arm but Iroha breaks it up, Inoue comes in but Kadokura quickly rolls her up for two. Dropkick by Kadokura and she tags Iroha, kicks by Iroha and she knocks Inoue to the mat before kicking Hamada for extra measure. Hamada comes in after that but Kadokura returns too and the youngsters dropkick Inoue and Hamada. Iroha goes up top but Inoue joins her and armdrags her to the mat. German suplex hold by Iroha, but Inoue kicks out. Iroha goes off the ropes but Inoue catches her with a head kick, picking up a two count. Inoue tags Hamada, Hamada kicks Iroha in the head repeatedly but Iroha blocks one and the pair trade elbows. Iroha ducks Hamada’s heel kick and hits a superkick, bridging underhook suplex by Iroha and she gets a two. Hamada catches Iroha with the heel kick the next time she tries, she goes up top but Kadokura grabs her from the apron. This gives Iroha time to recover and she hits a Liger Bomb for a two count. Iroha tags Kadokura, dropkicks by Kadokura and she covers Hamada for two. Iroha returns and they both attack Hamada in the corner, headscissors by Kadokura but Hamada catches her when she goes for a hurricanrana. Crab hold by Hamada but Kadokura manages to get to the ropes, elbows by Kadokura but Hamada fires back with a boot. Inoue comes in and they hit a double elbow drop, Hamada puts Kadokura in a Mexican Surfboard but Iroha breaks it up. Side slam by Iroha to Hamada, Kadokura goes up top and she delivers a missile dropkick for a two count cover. Hurricanrana by Kadokura, but Inoue breaks up the cover. Kadokura goes off the ropes but Hamada levels her with a lariat, Hamada goes up top and she nails the moonsault for the three count cover! Inoue and Hamada are the winners. This is a ZERO1 Offering match. Why ZERO1 has a match I am not sure, however Tanaka did wrestle in SEAdLINNNG earlier this year so there is a connection there. This match was really clipped so I won’t waste much time doing an introduction, just a quick match with wrestlers featured in ZERO1. Hidaka and Suzuki begin for their teams and trade submissions, armdrag by Hidaka and he hits a headscissors, but Suzuki quickly flips to his feet. Tanaka and Sato tag in, they trade chops and elbows until Tanaka floors Sato with a jumping elbow. Tanaka goes up top and hits a diving crossbody, jackknife by Hidaka but the cover gets two. Hidaka picks up Sato and connects with a high kick, but Suzuki breaks up the cover. Hidaka goes for Sliced Bread #2 but Suzuki catches him and hits a tombstone piledriver. Blue Destiny by Suzuki and Sato kicks Hidaka in the chest. Piledriver by Sato to Hidaka, he picks up Hidaka and he hits a German suplex hold for the three count! Sato and Suzuki win the match. Way too clipped down to get excited about. A few good moves were hit, but with less then four minutes shown they spent half of that showing just intro-level limb work before they cut straight to the home stretch. 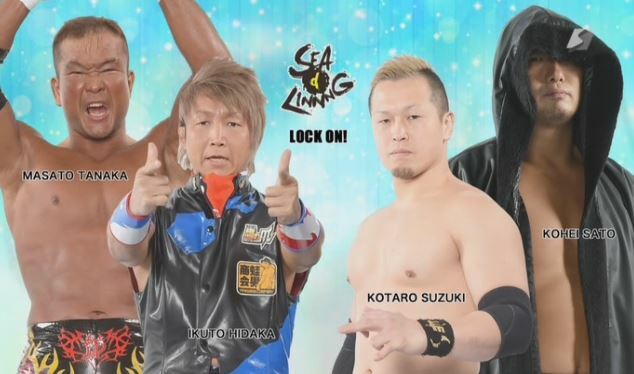 ZERO1 fans may have been excited when the match got announced but SEAdLINNNG clearly was not catering to them as it was by far the most clipped match on the show. Back to the Joshi! This match will be refereed by Natsuki Taiyo, so you know it won’t be an overly serious affair, there are some strange rules in matches she is in charge of that leads to wrestlers bouncing off the ropes a lot before they are allowed to make a cover. As for the match participants, we get an odd combination as none of these wrestlers normally team together as they are from different promotions. Kurumi’s home base is Ice Ribbon, Miyazaki is a Freelancer that frequents WAVE, Fujimoto is also from Ice Ribbon and Hotta wrestles in Diana. So a unique combination of wrestlers in what no doubt be a unique match. Hotta and Miyazaki start things off but are slow to engage, they trade wristlocks until Fujimoto comes in and Miyazaki is double teamed. Taiyo won’t count the cover since Hotta hasn’t run off the ropes yet (one of those weird rules I mentioned earlier), Fujimoto stays in as legal and Miyazaki throws her down by her hair. Miyazaki tags in Kurumi, body press by Kurumi and she applies a modified cattle mutilation. She releases Fujimoto after a moment and tags Miyazaki back in, leg drop by Miyazaki and she applies a submission hold with Kurumi’s help. Taiyo gets involved and ends up helping Fujimoto, Miyazaki gets back in control and applies a submission hold, but Taiyo covers up Fujimoto due to the pose the hold put her in. Taiyo doesn’t allow indecency. Taiyo dropkicks Miyazaki and helps Fujimoto double team her, but again Miyazaki gets the better of Fujimoto and remembers to bounce off the ropes before covering her for two. Dropkick by Miyazaki and she tags Kurumi, front flip senton by Kurumi and both wrestlers bounce off the ropes lots of times to make Taiyo happy. Fujimoto bridges out of a pin attempt and dropkicks Kurumi, leaving both wrestlers down on the mat. Hotta comes in with renewed vigor and plays around with Taiyo, as everyone puts on headbands. Kurumi is thrown to the mat and everyone runs over her, Kurumi gets annoyed and shoulderblocks everyone, even Hotta. Cannonball by Kurumi to Hotta, she goes up top but Hotta avoids the diving body press. Cover by Hotta but she forgot to run off the ropes so Taiyo won’t count it. Fujimoto reminds her so Hotta starts going off the ropes, meanwhile Fujimoto and Kurumi trade pin attempts. Hotta finally covers Kurumi, but it only gets two. Hotta goes off the ropes but Miyazaki kicks her from the apron, enzuigiri by Fujimoto to Kurumi and she hits the Venus Shoot. La Magistral by Hotta to Kurumi and she gets the three count! Hotta and Fujimoto are the winners. Another slightly mixed tag match (mixed promotion, of course), although none of these wrestlers regularly team together. 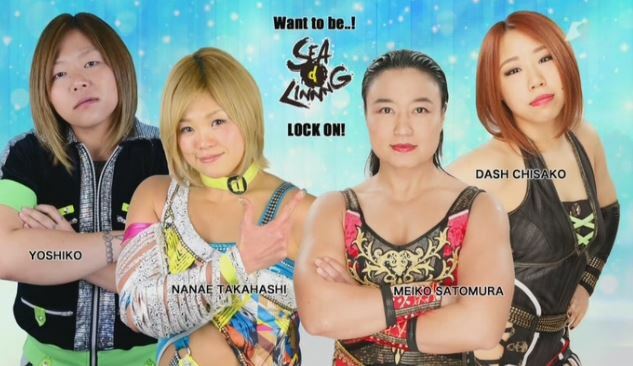 Nakajima represents JWP, where she is one of the leading wrestlers of the promotion, while Sareee is the young future star from Diana. Yamashita technically is affiliated with Daijo Pro but she wrestles a lot in Pro Wrestling WAVE, which is also where Mizunami is from. None of these wrestlers are pushovers so there is no weak link, even though Sareee is easily the youngest wrestler in the match. Nakajima and Yamashita start off but Sareee and Mizunami are in the ring too and everyone trades elbows. Sling Blade and a dropkick by Nakajima to Mizunami but Mizunami comes back with a hard shoulderblock. Nakajima boots Mizunami but Mizunami gets up and the two trade elbows. Nakajima tags in Sareee, Sareee elbows Mizunami but Mizunami hits a shoulderblock followed by a scoop slam. Leg drop by Mizunami and she tags Yamashita, Yamashita trades chops with Sareee until Sareee dropkicks Yamashita into the corner. They trade quick pins with no result so Sareee tags Nakajima back in, Nakajima dropkicks Yamashita and hits a knee against the ropes. Nakajima goes up top and hits a missile dropkick, covering Yamashita for two. Yamashita comes back with a knee of her own and hits a big backdrop suplex, covering the veteran for two. Kicks by Yamashita and she goes off the ropes, she hits one lariat but Nakajima pulls her down by her hair before she can hit another one. Nakajima stomps on Yamashita but Yamashita fires back with a hard elbow. Lariat by Yamashita and she tags in Mizunami, Mizunami picks up Nakajima and hits a powerslam for two. Running leg lariat by Mizunami but Nakajima kicks out again, she goes off the ropes but Nakajima ducks a lariat and they trade elbows. Nakajima gets Mizunami to the mat first and goes for a few quick pins with no luck, German suplex hold by Nakajima but that gets a two as well. Nakajima goes for a dragon suplex but Mizunami reverses it with a Saito Suplex, Nakajima lands near her corner and Sareee tags herself in. Sareee tries to suplex Mizunami with no luck, release German by Mizunami but Sareee dropkicks her against the ropes. Four more dropkicks by Sareee and she hits a German suplex hold, but Mizunami kicks out at two. Missile dropkick by Nakajima, both her and Sareee get on different turnbuckles and they both hit missile dropkicks. They both hit two more missile dropkicks until Yamashita grabs Nakajima and comes into the ring, Yamashita joins Sareee up top and she hits a superplex. Spear by Mizunami to Sareee, she goes off the ropes and Sareee ducks the lariat, but Yamashita lariats Sareee instead. Lariat by Mizunami, but Nakajima breaks up the cover. Mizunami goes to charge Sareee but Nakajima kicks her, German suplex hold by Sareee but it gets a two count. Yamashita runs in and lariats Sareee, Mizunami lariats Nakajima but Sareee catches Mizunami with a Uranage. She goes for another one but Mizunami blocks it and hits a hard lariat. Sareee temporarily gets away from Mizunami but eats another lariat for her trouble, Mizunami hits a lariat again and covers Sareee for two. Mizunami has had enough and plants Sareee with the Hot Limit, and she picks up the three count! Yamashita and Mizunami win! This match is celebrating Takahashi’s 20th Anniversary in wrestling. 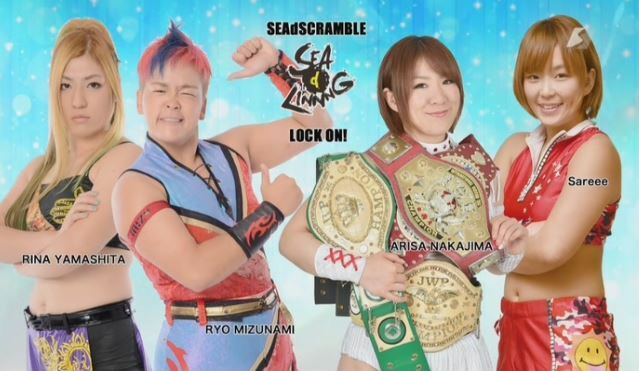 SEAdLINNNG and Sendai Girls’ have been feuding at least somewhat officially for the entire year, with a few cross-promotional matches along the way. 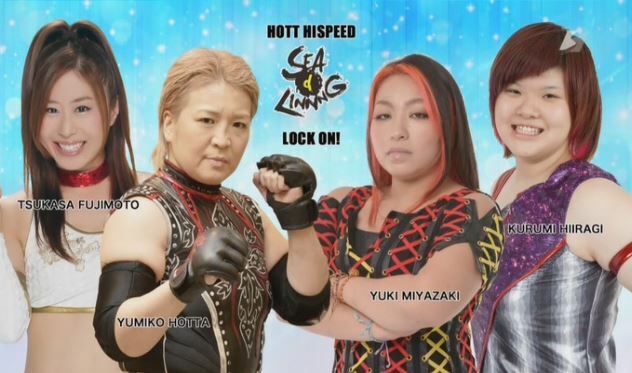 This is one of their biggest matches to date, as the leader of Sendai Girls’ (Satomura) brings one of her best wrestlers with her to take on the leader of SEAdLINNNG (Takahashi) and her best wrestler. Expect hard hits and a bit of hate from these four, as when Joshi promotions do inter-promotional feuds they don’t hold back. Chisako and Yoshiko start the match as the promotional leaders look on from the apron, these two aren’t friends either however as they quickly start trading hard strikes. Yoshiko gets Chisako to the mat first and applies a camel clutch, she throws Chisako into the corner and tags in Takahashi. The SEAdLINNNG stars double team Chisako for a moment, Takahashi clubs Chisako down to the mat and kicks her into the corner. They end up on the floor and Takahashi throws Chisako into the crowd, they return to the ring after a moment and Yoshiko comes in hit a backbreaker on Chisako. Missile dropkick by Takahashi and she covers Chisako for a two count. Quick cutter by Chisako and she tags in Satomura, Satomura chokes Takahashi with her knee and kicks Takahashi in the chest. Takahashi fires back with a lariat and goes for a splash off the second turnbuckle, but Satomura gets her knees up and kicks Takahashi in the back of the head. STF by Satomura but Takahashi wiggles to the ropes and forces the break. Satomura tags in Chisako, dropkicks by Chisako but Takahashi blocks the Northern Lights Suplex. Chisako ducks a lariat and hits the move anyway, picking up a two count. Chisako tags in Satomura, Satomura puts Takahashi in a sleeper and then applies an ankle hold when Takahashi goes for a kick. Satomura kicks Takahashi some more but Takahashi catches one and drops Satomura to the mat. This gives Takahashi time to tag in Yoshiko, lariats by Yoshiko and she hits a running senton. She hits a second one but Chisako trips her from the apron when she goes for a third, she gets in the ring but Yoshiko lariats both of them. Yoshiko lariats Satomura in the corner and she hits face washes, but Satomura jumps up and elbows her. Satomura catches Yoshiko with a heel kick and tags in Chisako, Chisako goes up top and she hits a missile dropkick. Yoshiko starts her comeback with an elbow and they trade strikes, Chisako goes off the ropes and she boots Yoshiko to the mat for a two count. She goes off the ropes again but this time she eats a hard slap, elbows by Yoshiko in the corner and she hits mounted elbows and slaps. Pump handle slam by Yoshiko, and she covers Chisako for two. Chisako blocks the Chokebomb and hits a Stunner, but Yoshiko hits a lariat. Chisako ducks the next one and hits a release German, she goes off the ropes but Yoshiko hits a lariat. She tags in Takahashi, backdrop suplex by Takahashi but Chisako kicks out. Satomura comes in and kicks Takahashi, she stays in but Takahashi lariats both of them. Satomura falls out of the ring so Takahashi sails out after her with a tope suicida, inside the ring Yoshiko elbows Chisako and Takahashi lariats her once she returns. Takahashi goes off the ropes but Chisako catches her with a hurricanrana for a two count. Chisako dropkicks Takahashi in the corner and nails a diving footstomp off the top, but Takahashi kicks out of the cover. Chisako goes up top but Takahashi gets her feet up on the Hormone Splash, Takahashi goes up but Satomura grabs her from the apron. Chisako joins Takahashi up top and hits an avalanche cutter, but Yoshiko breaks up the cover. Chisako tags in Satomura, kicks by Satomura and she hits a rebound elbow out of the corner. Jumping kick by Takahashi but Satomura kicks her back and hits the cartwheel kneedrop. Sleeper by Satomura but Takahashi quickly gets out of it, kicks to the chest by Satomura and she applies a submission hold. Yoshiko breaks it up with a lariat, she picks up Satomura but Takahashi lariats Yoshiko by accident. Chisako runs in to elbow Takahashi, backdrop suplex by Satomura to Takahashi and she covers her for two. Backdrop suplex by Takahashi and she hits a lariat, but Satomura kicks out of the cover. Nana☆Racka by Takahashi, she goes up top but Satomura joins her and hits a superplex. Sleeper by Satomura, Chisako gets Yoshiko in the corner to stop her from breaking it up, Death Valley Bomb by Satomura but Yoshiko flings Chisako at Satomura to break up the cover (breaking Takahashi’s teeth in the process by accident). Diving senton by Yoshiko onto both Satomura and Takahashi, she then lariats Satomura and Takahashi plants Satomura with a belly to back piledriver. Superman punch by Takahashi, she picks up Satomura and nails the One Second EX for the three count! The winners are Nanae Takahashi and Yoshiko. This was from top to bottom a really strong effort from SEAdLINNNG. Nothing was bad on the show, which is always a plus, and the matches that were designed to be hard hitting and full of action all were. The men’s match was clipped down to nothing, but since they were just here for a one-off appearance I am glad they clipped it and left the last three matches in full (or darn close to it). The last two matches were both great, as Takahashi has done a good job of pulling in other really entertaining wrestlers to flesh out the cards. You really can’t go wrong with this event, as always I wish it was shown in full and that there was an additional match or two, but still an enjoyable show I can easily recommend.